Who can forget the words of the iconic song “Blue Christmas” sung by non other than Elvis Presley (that is for those of us of the senior generation). As the Editor and I enter into this week before the celebration of the greatest gift to mankind, we want to wish each of you and your families, a very Merry Christmas. We really don’t want you to have a Blue Christmas missing someone. However, we do want to share a Blue (Heron) Christmas with you. While on a recent workshop I stopped by the Viera Wetlands to see Gus and Greta, the nesting pair of the Great Blue Herons once again. Gus and Greta were embraced together, silhouetted in the pre-dawn light, to greet the morning. Gus flew off to gather nesting material before the sunrise and was greeted by Greta with enthusiasm with each simple gift. Greta then carefully placed each stick with care. A bit later it appeared something was said that upset poor Gus (something about leaving for Christmas). However, they were quick to make up and hug each other in just a matter of moments. Had this not taken place it could have ended just like the song, a real Blue Christmas. The Ibis (both white and glossy) were there also (decorating a tree) as were many other birds. On my return trip I also got a few photos of Florida’s beautiful native blue and gray feathered Scrub Jay. Gus gathers nesting material and presents them to Greta who seems thrilled with the gift. Gus, promise me you will be here for Christmas! I would be so blue without you..
Greta ,where did you get that crazy idea I would ever leave you? From Elvis the Egret? Give me a hug please! I may be a Great Blue but I would be even bluer without you Greta! White Ibis prepare to "decorate" the barren tree..
A Glossy Ibis flies off for some last minute Christmas shopping. Winter Solstice Dawns on the Broward..the shortest day and longest night of the year. Wishing you a Merry Christmas from Reflections on Broward.. The “General,” our Bald Cypress, is getting more barren each day. Soon all that will be showing will be the stark bare branches until spring. The crisp clear blue skies of December have filled the Broward this past week. Unfortunately I have had little opportunity to enjoy it until the past few days. Not sure about the rest of you young ones out there but getting up and dancing is about the last thing you might find on my daily agenda. Not so with the Great Egrets however, they love their morning dance. The Editor calls the Great Egret the "Bride of the Broward". Adorned in pure white flowing feathers, there is nothing more elegant and graceful looking on the Broward this time of year than the Great Egrets. Soon they should start showing the emerald green eye shadows of the coming breeding season. Each day there is one Great Egret in particular that has a favorite fishing hole near our dock. 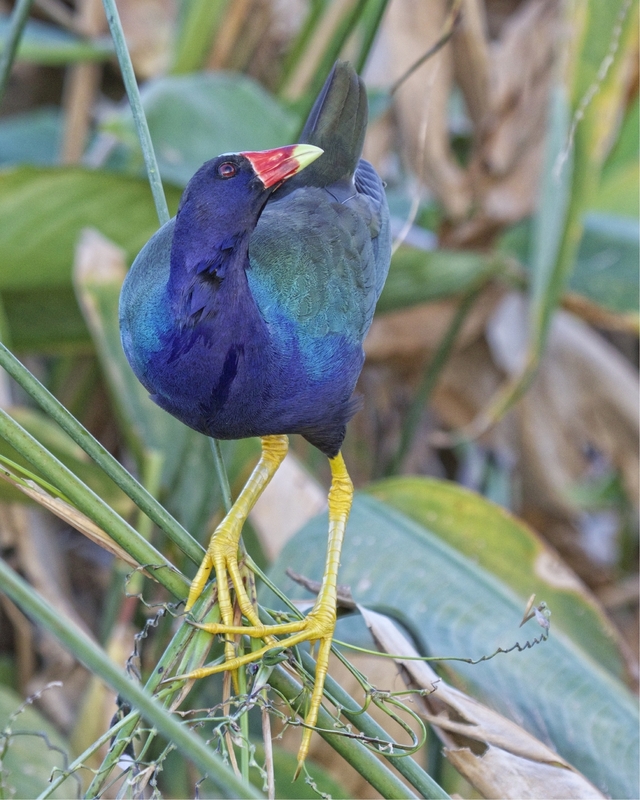 When the tide begins to recede, this graceful bird steps out of the shadows to begin its morning dance on the marsh. Not to be outdone, a Pied-billed Grebes also swims by with a rendition of “Splish Splash..I was takin a bath”! While waiting on the grebes to appear the last few days I was joined by another companion on the dock. Annie, a female Anhinga has decided I am not a threat anymore. For the past several days now she flies up and lands right beside me and suns herself for about a half hour each morning while drying and preening her feathers before gently slipping into the water to begin her morning feeding. The fur like feathers keep it insulated from the cold water as this species spends a great deal of time completely submerged chasing fish. I wish I could see her underwater ballet. Her graceful head pops up and looks around before taking another dive. The Bride of the Broward, the Great Egret steps out of the shadows to begin its morning dance.. Graceful wins kiss the water..the dance continues.. I was a movin' and a groovin..
Splish Splash..I was takin a bath...Great balls of fire! Annie the Anhinga has been joining me each morning on the dock the past few days..
Time for the underwater ballet to begin..unless of course you still got shopping to do..